The 1977 350th Anniversary Edition is a much sought after printing amongst enthusiasts, the first to contain specially commissioned artwork to aid with the diet. The Rubens Diet, created in 1627 by Flemish artist Peter Paul Rubens, in an effort to aid undersized women in achieving a more culturally acceptable full-bodied, not to mention voluptuous, figure. Reprinted continuously for almost four hundred years, the book remains popular to this day where it still regularly features on the best sellers list, beating more modern self help books such as The Obese Man's Handbook and Home Lipocramming - the DIY Guide to Gaining Weight. The classically-educated humanist scholar Peter "Piper Picked a Peck of Pickled Peppers" Paul Rubens had from an early age come to the conclusion that unnaturally thin ladies made for very poor partners. An entry in his diary dated June 1598 details an encounter with such a lady during his college days which clearly left an impression upon the young man - "verily jumping on said strumpet was like unto jumping upon a sack of bones, with many angular partes thereupon which left me much a-bruised for several days thereafter." Over the next few years as his artistic career flourished he began to offer advice to his models on how to gain a more perfect figure. This was at a time when the first major imports of the dried and fully fermented fatty seed of the cacao tree from the colonies occured, and the resulting product was a useful and popular tool in assisting weight gain. In a precursor to The Rubens Diet, his 1619 release On Why Ladys Should Be Well Rounded, Rubens wrote that the more curvaceous a woman the more it was a sign of well being, plenty and the ability to survive hard times. He argued that back in the days when hunting provided a large proportion of our food having a more voluptuous wife was the equivalent of driving a Ferrari. Rubens was in fact the not the first to promote a healthy lifestyle for women, however he was the first to develop a robust concept marketing the benefits to his patronage, noting that "...the language employed in the pitch should be as luscious, sensual and zoftig as the clients that we seek to create...creamy white skin...a thick, more manageable and shiny coat that bounces and behaves...rosy cheeks; both sets!" This combined with Ruben's artistic talents of painting and affecting an Australian accent, formed the basis for his recipe of success! 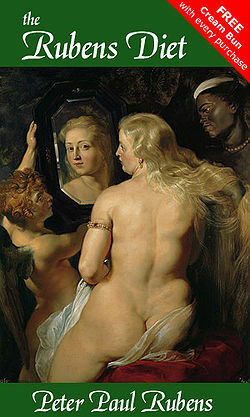 Even women at the lower end of the accepted body mass index have been known to promote the Rubens Diet. Movie star Sophia Loren utilised the diet to improve her ample charms. It is safe to assume that Rubens intended to target the mushrooming middle and upper crust with his meaty text. As an appetizer, he cloyingly served up a veritable smörgåsbord of culinary delights to tickle the tongue and warm the tummy. Suggested meals eschewed variety meats, in their place came seven course meals heavily with fresh creme, succulent prime cuts of meat, generously marbled with flavors and gravies and robust full bodied puddings and indulgent snacks. "Another crepe Suzette? Don't mind if you do!" "Laying languidly in leasure, one should never reach for grapes lest the effort burns precious tissues in your exertion. Wait for the cherubs to feed you such foods that offer little healthful benefit (fresh fruits and such); save thy strength for merry making and suckling new born babes. Could their be anything more invitiing? I think not!" "For the Jewess amongst you, let the handmaids keep warm thy hearth! Thy ample bosom should swell to such proportions as to match the great wealth of your benevolent banker husbands. Do not ask if a third knish is too much! Go ahead, eat! Starving yourself for what, and for whom? The more you, the more of you there is to drape in fine silks and precious jewels!" A number of leading movie stars and models have been known to use the Rubens Diet in an effort to gain the pounds. Mae West did radio commercials for the diet, claiming "The more places I give my men to put their hands, the more men I need to put their hands on my places, sweetie..."
Mommas and Poppa's singer Cass Elliot was a fan of the diet until her premature death from not enough mayonnaise on her ham sandwich, which would have fully greased her food pipe and thus prevented an early death. In her autobiography English Actress Dawn French named the diet as one of the primary sources of helping her to maintain her stunning figure. Talkshow host and serial binge dieter Oprah Winfrey finally managed to gain an acceptable weight thanks in no small part to the Rubens Diet. It was Roseanne Barr, however, who raised the spector that the diet may not be all its cracked up to be. Once a guide for the wealthy, Barr demonstrated that the lowest of the low lying underclass were taking up the cause. And isn't it just like Roseanne to ruin it for everyone? In recent years a number of critics have spoken out at both the diet and the media's "ideal" body shape for women. Chronically thin celebrities from Jean Shrimpton to Kate Moss have hit out at the idea that thin women cannot be beautiful. "Can I help it if I'm thin boned? No amount of glazed cream doughnuts have helped me to gain a pound." Her fellow clinically underweight friend Jody Kidd questioned the dangers and pressures it puts young girls under to achieve the fuller figure, with many binge eating in an effort to pile on the weight. Those who have tried everything and still have been unable to gain a pound have resorted to all sorts of nonsense, including bulimia, believing that their overeating stretches their stomachs, which they purge for meal number two. Silly girls - they must digest the food to get the full effect of the nutrients! During the 1998 Miss Wide World competition Miss Bangladesh was found to be wearing "padding" during the pie eating section of the show, leading to her tearful withdrawal from the program, where she claimed that not even the Rubens Diet had been able to help her to achieve "Dangerous curves ahead and world peace, of course.....tee hee"